Today, I want to share a great beauty tip that occurred to me recently. You’re walking down the road just in front of your house, perhaps. Not thinking too much. Just taking in everything around you. And then you begin to find the need to pause – a bright mustard butterfly flapping its wings; leaves attempting to grow in the hollow of a gnarled plant; a woodpecker pecking away at an old tree; tall trees framing a blue sky. And each time you stop and say, ‘Thank you, life is beautiful’. You realize that beauty is all around you. And you know what? You can’t identify and acknowledge something outside you as being beautiful without acknowledging that YOU are beautiful. Of course, you could choose to go through life walking down the same road smelling dog poop, grumbling at the stones in your path and generally being upset at how hot it is. And yes, constantly finding ugliness all around will make for an ugly life. So what’s the beauty tip then? It’s up to you to acknowledge or deny beauty around you and within you. The more you see beauty around you, the more you will find it within you. Let’s make time in our hearts and minds today to look for beauty outside and within us. Join Parul and other bloggers for Thursday Tree Love. Only criteria is that you love trees and share pictures of them. It is just so amazing and inspiring. Loved your blog!! Congratulations…. Beautiful pictures. Old and young intertwined. Beautiful. That’s such a beautiful message. They say, when you seek beauty in all people and all things, you will not only find it, you will become it. That pic with a sapling in a tree speaks volumes and is a profound life lesson! That Roald Dahl quote is one of my favourites, Corinne. Especially loved the opening paragraph of the post which sums up my experience every time I go for a walk in the park. Both the tree images are lovely but the one of the sapling is definitely worth a thousand words! I’m a great believer of finding beauty in everyday things…it is all around us, all we need is the eye to see it and find it deep within us. What a lovely post. I loved the poetic descriptions ☺️ good dose of d beauty of positivity right here in this post. Wise words. I also like to think that smiling makes people wonder what I’m up to. What a beautiful thought. Beauty is all around us, we really need to stop and look at all the positive things that is happening around us. That is so true, Corinne, we find what we seek. I couldn’t agree more. My life revolves around finding beauty around me. Sometimes to the extent that I tell myself to stop because people around me wonder what am I up to. Thank you so much for the little referral 🙂 means a lot! Hugs! I realize how true is that with me. When I feel happy inside, every person and everything gives me happiness but when I am not happy with myself, I feel detached, gloomy and left out. A great thought to begin the week. I so agree Corrine! Beauty within is reflected out. I’ve noticed that on the days I’m mopey and depressed, I find nothing of beauty out in the world. But if I can stop to just and center myself, I can shift my perspective. I agree – we have a choice in whether we see the beautiful or the ugly, the good or the bad, because we are constantly surrounded by both. That’s a great thought to begin my week with. 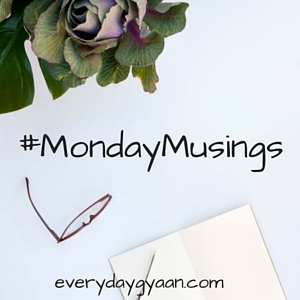 Joining in this week with my musings. Corinne the message in this post makes me want to hug you. I know if there is one place which will be overflowing with positivity and self-love even if the world is falling apart, it will be here, your blog. I aspire to follow your foot prints for life.